Quinnipiac men’s ice hockey was announced as the No. 1 seed in the NCAA Tournament Sunday evening during the NCAA Selection Show. The Bobcats were featured live on-set at the ESPN studios in Bristol during the show. Quinnipiac will faceoff against 16-seed Canisius on March 30, at the Dunkin’ Donuts Center in Providence, R.I., and the event will be televised nationally on ESPN3. Pecknold went on to describe the ranking as “a little surreal at times.” He believes that his team will be ready to go come game-time on Saturday. “Ultimately for us it’s about competing and being hungry, and ready to play,” Pecknold added. 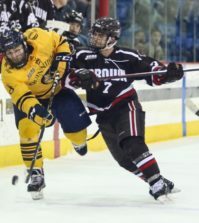 Atlantic Hockey’s Canisius College finished at seventh in its conference with a 19-18-5 record. 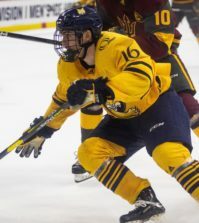 While the Griffins come into the tournament as the lowest overall seed, it’s important that the Bobcats don’t look past a hot team that is coming off its first ever Atlantic Hockey championship victory. 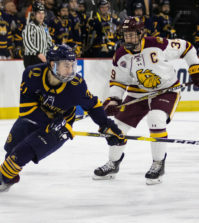 In the AHA Tournament, Canisius junior Kyle Gibbons tallied 12 points in six playoff contests with four goals and eight assists, proving to be a valuable asset in the Griffins’ journey to their first conference championship. This will be the first trip to the NCAA Tournament for Canisius while it’s the second for the Bobcats with their last appearance coming in 2002. 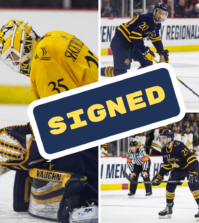 While Gibbons has arguably been the most impactful player for the Griffins, Quinnipiac senior goaltender Eric Hartzell fills that role for his team. ESPN hockey analyst and former NHL defenseman Barry Melrose had nothing but good things to say about the Hobey Baker award finalist. The other half of the East Regional bracket belongs to Boston College and Union. The Dutchmen enter the tournament fresh off a win over Brown for their second-consecutive ECAC title. They will look to take down defending national champions Boston College at 9:00 p.m. on ESPNU. This means that in the second round, the Bobcats could either face national powerhouse Boston College or Union who they swept this season. On the other half of the bracket is Minnesota, who has been with the Bobcats at the top of the rankings for the majority of the season. Despite being the top overall seed, Pecknold sees Minnesota as the team to beat in the tournament.